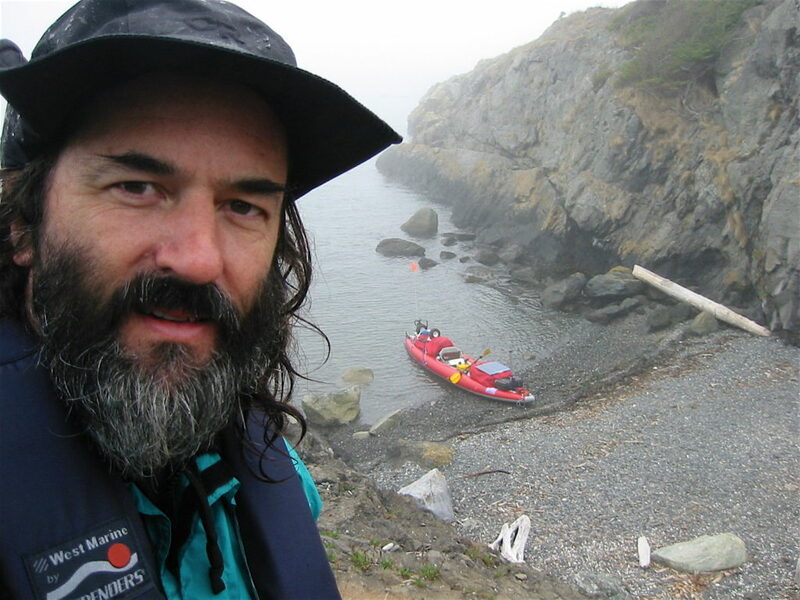 When the Microship project ran out of steam in 2002 after a decade of work, I had the urge to get on the water without any more complexity than necessary. Of course, that is a highly subjective subject, and with my technomadic affliction it would not do to merely hop in a kayak and paddle around. I obviously needed a solar power system, location tracking, data and voice communications, lighting, navigation, power for a laptop, and general comfort facilities… but I didn’t want to turn it into another ambitious open-ended project like the Microship. 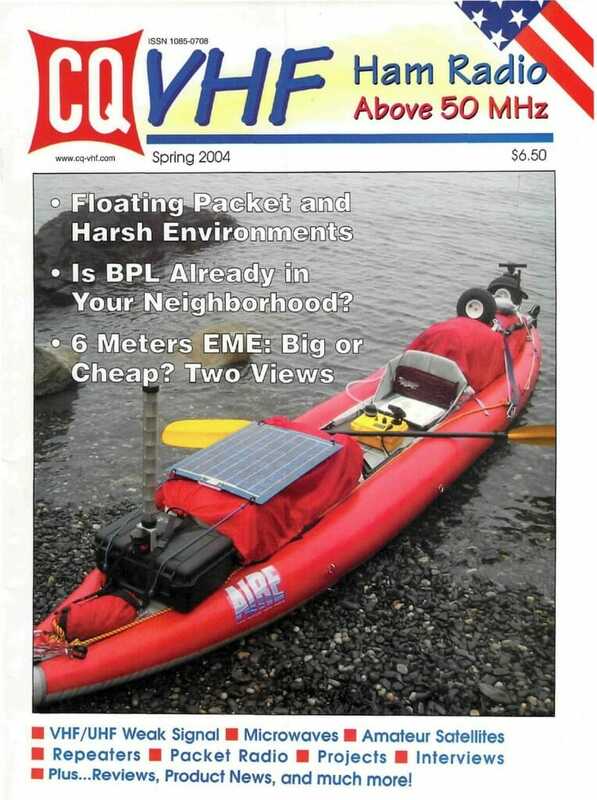 This was the result… an inflatable kayak named Bubba, carrying three waterproof electronics boxes tied together by a cable harness. 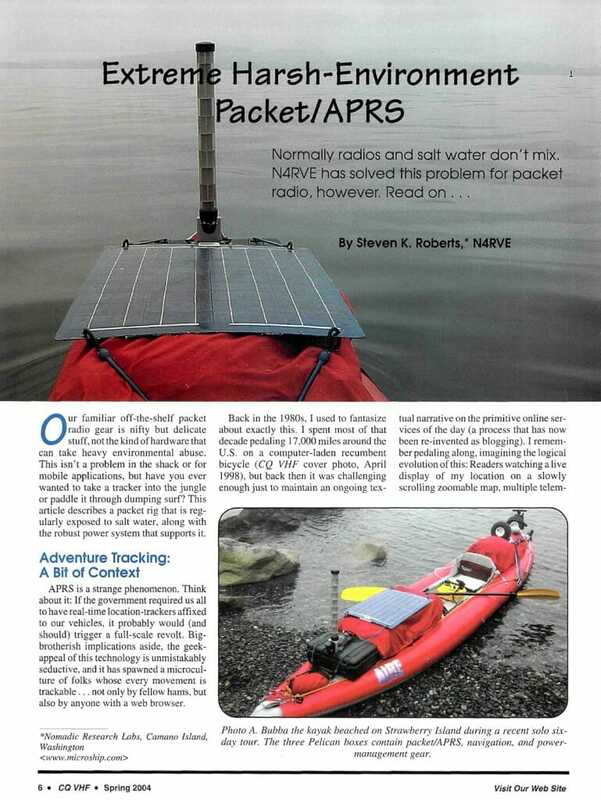 I had a ball with it, and wrote this article focusing on the packet APRS tracking system. Our familiar off-the-shelf packet radio gear is nifty but delicate stuff, not the kind of hardware that can take heavy environmental abuse. This isn’t a problem in the shack or for mobile applications, but have you ever wanted to take a tracker into the jungle or paddle it through dumping surf? This article describes a packet rig that is regularly exposed to salt water, along with the robust power system that supports it. APRS is a strange phenomenon. Think about it: If the government required us all to have real-time location-trackers affixed to our vehicles, it probably would (and should) trigger a full-scale revolt. Big-brotherish implications aside, the geek-appeal of this technology is unmistakably seductive, and it has spawned a microculture of folks whose every movement is trackable… not only by fellow hams, but also by anyone with a web browser. All of this is now pretty easy and is part of the Microship project—the technomadic adventure substrate that has replaced my tattered, overloaded recumbent bicycle (now on display in The Computer History Museum in Silicon Valley). These two amphibian, pedal/ solar/sail micro-trimarans are packed with enough technology to exceed that long-ago road fantasy, but what I want to tell you about here is much simpler—a pile of off-the-shelf stuff packaged in Pelican boxes and lashed to an inflatable kayak. In the process, we can look at a few packaging techniques that will let you put APRS into all sorts of nasty places where electronic devices usually don’t stand a chance. There is an old adage that the average completion time of a homebuilt boat is 137 years. With that in mind, and needing a dinghy for shore excursions (landing gear notwithstanding), I added a 19-foot Aire Sea Tiger to the Microship fleet. Given this quickly deployable playboat, I have been unable to resist the allure of local exploration of the endlessly interesting waters here in the Pacific Northwest. Appropriately dubbed Bubba, this wonderfully stable and buoyant craft spends a lot of its time in salt water, with occasional river excursions. I carry a full suite of camping gear, as well as my laptop backpack in a sealed case, so computing horsepower under the stars is not a problem. What is more challenging is the set of resources needed underway: battery management, navigation lights, communications, and APRS. The black box on the bow contains a KPC-3+ packet TNC, a wonderful old Yaesu 290, a USB-serial interface for the Mac laptop, a headless Garmin GPS-35, 24 amp-hours of 12V sealed lead-acids, a Micro-M+ solar charger (using the 30-watt Solarex PV panel lashed to the forward gear mound), an AC unit for those times when I have shore power available, a Statpower inverter for laptop and digital camera chargers, a MAHA Ni-MH charger for all the pocket gadgets that use AA batteries, a bicolor navlight retrofitted with Luxeon 1-watt LED emitters, a 350mA constant current source for same, and a Mobri radar reflector. The yellow box, between my legs when I’m paddling, carries a cartographic Garmin GPSMAP-76S, separate steering compass, switch for the nav lights, button for the horn, and internal foam-lined space for the Canon digital camera (in its own waterproof case), Aquarian Audio hydrophone, binoculars, and basic emergency tools. The gray box at the stern (barely visible in the photo) carries a homebrew 1-watt white LED sternlight, 350 mA constant current source, small yacht horn, and a fiberglass bike flag on a Hustler bayonet-mount supporting a 2-meter twin-lead J-pole. The interior of that box carries tools, patch kit, and electric air pump. Pelican boxes themselves do an excellent job of keeping out the elements, but as soon as we add connectors and external devices, we’re asking for trouble. The wiring harness on Bubba was designed with the assumption that it would be soaking wet most of the time, and thus uses undersea-pluggable connectors made for oceanographic applications, integrated into a spiral-wrapped assembly that can dry out whenever given the chance. This cable bundle consists of four DC wires and one piece of coax. Let’s look at the wiring diagram for the system. As much as possible, I took advantage of off-the-shelf subassemblies: one of the major lessons that has emerged from two decades of building complex machines is that life is too short to re-invent the wheel. This whole system came together in a couple of weeks, largely because I didn’t insist on over-complicating anything with custom electronics, computer control, integrated user interfaces on ad-hoc networks of wireless-linked PDAs, or anything else Microship-like and tres geeky. As such, it’s not quite as small or tight as it could be, but it works well and can easily be replicated by others who want to add these capabilities to tiny boats. Two hefty Powersonic 12V, 12AH Sealed Lead Acid Batteries comprise the power pack, ensuring that I have a comfortable margin of operation in this often-overcast part of the planet. Fully charged, they can run the high-brightness LED navlights for at least a week of all-night paddles (very rare! ), and also provide continuous APRS tracking for a few days. This is one area in which overkill doesn’t bother me; it’s nice to have ample power (and on a kayak, weight is not as much of an issue as on a bicycle or backpack… though I do confess to grumbling a bit when I have to drag all this stuff up a cliff for the night). Internal wiring is very simple, and most of the action is in the vicinity of a big double terminal strip made by Blue Sea Systems (located under a chunk of foam inside the box shown in Photo B). The primary charge source for an autonomous mobile system like this, is, of course, photovoltaic, and a Solarex MSX-30 module provides a steady couple of amps on sunny days. 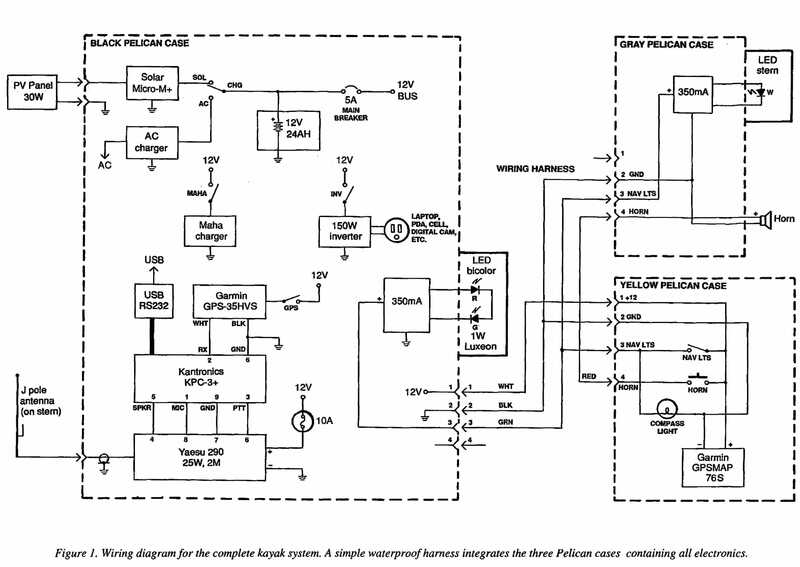 Because of the proximity to radios, I elected to use the Micro M+ charge controller, which generates no RFI. This comes as an easy-to assemble kit… and can handle up to 4 amps of charge current. When in the lab, visiting waterfront friends, or ducking into a marina, I am free to take advantage of shore power with a little Guest waterproof charger from West Marine. When AC is available, I throw a toggle switch to select this as a charge source instead of solar (they otherwise interact, and I didn’t want to deal with blocking diode losses and their unpredictable effects on the respective charge managers). Raw battery voltage to everything (except the Yaesu, which has its own 10-amp fuse) is switched with a 5-amp circuit breaker and connected to the positive bus bar. There are two additional items in the power department: a Maha charger for the seemingly unlimited number of AA batteries in my life, and a small Statpower inverter that generates 115 VAC to feed my laptop charger, digital camera charger, cell phone charger, PDA charger… well, you get the idea. I know, it’s not very efficient to go from DC to AC and back to DC, but until the industry standardizes its power protocols and provides universal conversion widgets, we are stuck with 115VAC as a sort of lingua franca in such situations. 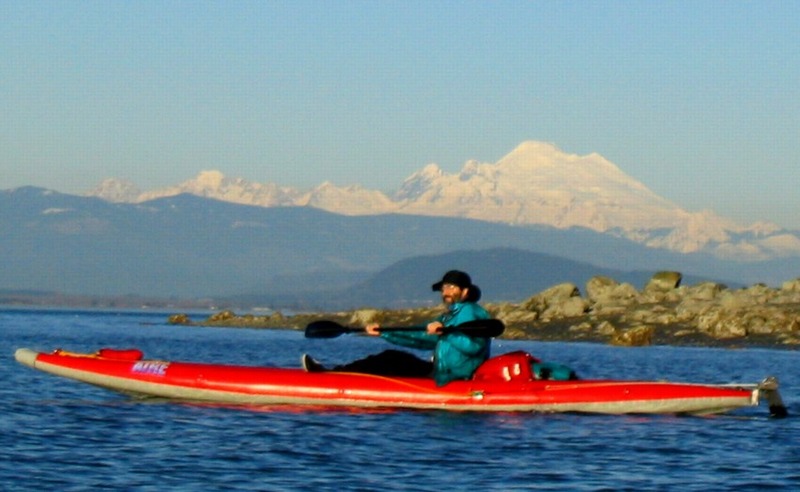 One of the key requirements for this system is safety-related: although I don’t usually choose to kayak at night (especially in busy shipping lanes), it does happen occasionally, often as a result of bad planning. When it does, I insist on being as visible as any other small craft, though from the perspective of an oceangoing freighter that’s not saying much. Being power-limited without an engine, the thought of off-the-shelf incandescent navigation lights was disturbing… even the smallest would consume a total of 15 watts for the bow bicolor and white sternlight. Instead, I bought a couple of small Aqua Signal Navlights from West Marine, tossed the original incandescent bulbs, retrofitted Luxeon 1-watt high-brightness LED emitters (complete with heat sinks), then drove them with 350 mA constant current sources made by TaskLED. These do generate a bit of RFI, but it hasn’t been a problem on the kayak (though it is on the Microship)… and the net effect is a beautiful suite of navlights for about 1/5 the power of the traditional solution. Photo C shows the sternlight assembly with the fresnel lens removed. This mounts on the gray Pelican box at the stern, with the constant-current source just inside the enclosure. Seeing this at night, it is difficult to believe it is but a single white LED; around camp, I use it as a utility area light both inside and outside the tent. Of course, one of the primary justifications for all this was the tracker. Shown unpackaged in Photo E, this is based on the excellent and very popular Kantronics KPC-3+, particularly attractive in this application because of its low current drain, general utility as a TNC, and dual-port capability that make it easy to switch between packet and APRS without fiddling with cables. The TNC is grafted to one of my all-time favorite 2-meter rigs: the venerable Yaesu 290. As a long-time aficionado of bicycle-mobile and other power-limited operating environments, one of my pet peeves is the fact that almost all “mobile” rigs have a standby current drain on the order of an amp. This is simply impractical in anything other than a car, but this Yaesu radio (like its 70 cm mate, the 790) draws about 50 mA when just sitting there… yet can still put out 25 watts. As such, I don’t mind leaving it on all the time, a necessity in an application like this. 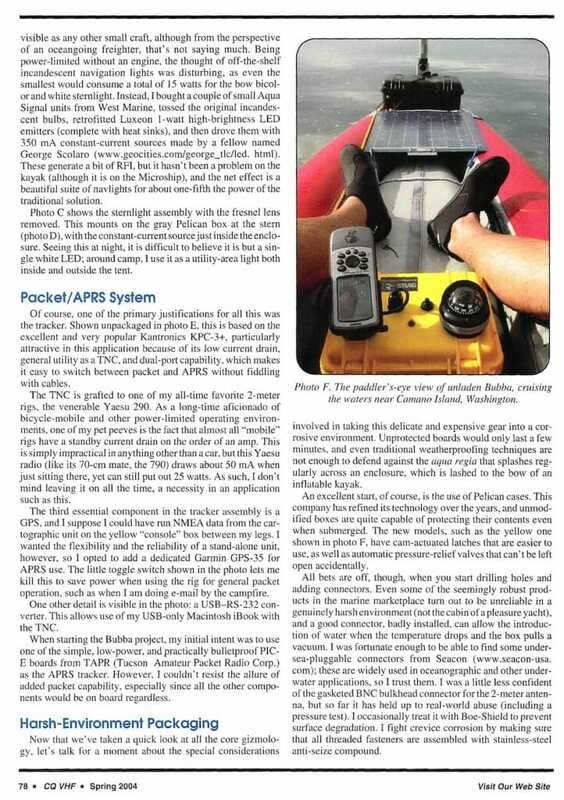 The third essential component in the tracker assembly is a GPS, and I suppose I could have run NMEA data from the cartographic unit on the yellow “console” box between my legs. I wanted the flexibility and reliability of a stand-alone unit, however, so opted to add a dedicated Garmin GPS-35 for APRS use. The little toggle switch in the photo lets me kill this to save power when using the rig for general packet operation, as when doing email by the campfire. One other detail is visible in the photo: a USB<->RS-232 converter. This allows use of my USB-only Macintosh iBook with the TNC. 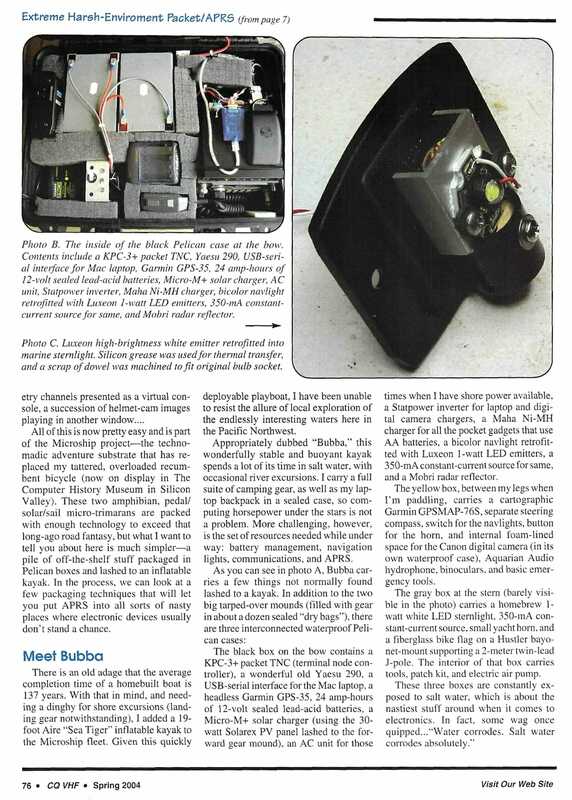 When starting the Bubba project, my initial intent was to use one of the simple, low-power, and practically bulletproof PIC-E boards from TAPR as the APRS tracker. But I couldn’t resist the allure of added packet capability, especially since all the other components would be on board regardless. Now that we’ve taken a quick look at all the core gizmology, let’s talk for a moment about the special considerations involved in taking this delicate and expensive gear into a corrosive environment. Unprotected boards would only last a few minutes, and even traditional weatherproofing techniques are not enough to defend against the aqua regia that splashes regularly across a enclosure lashed to the bow of a kayak. 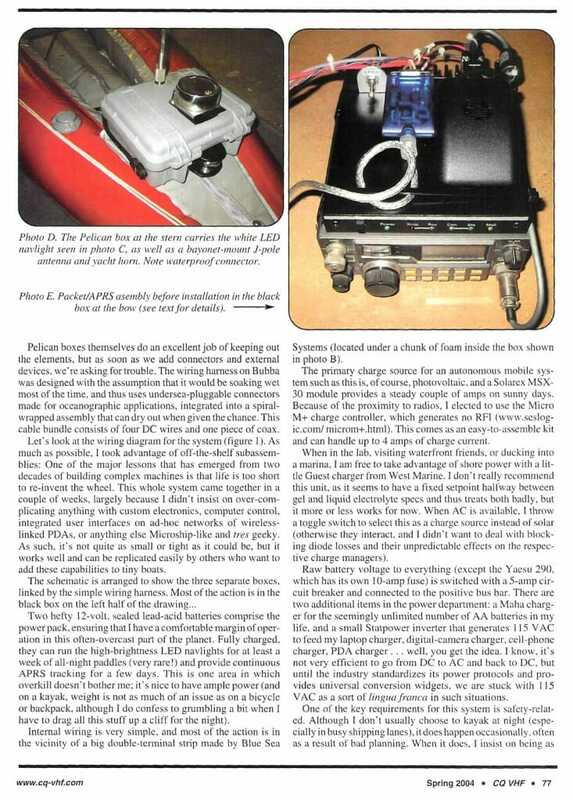 An excellent start, of course, is the use of Pelican cases… these folks have refined their technology over the years, and unmodified boxes are quite capable of protecting their contents even when submerged. Their new models, like the yellow one in Photo F, have cam-actuated latches that are easier to use, as well as automatic pressure-relief valves that can’t accidentally be left open. But all bets are off when you start drilling holes and adding connectors. Even some of the seemingly robust products in the marine marketplace turn out to be unreliable in a genuinely harsh environment (not the cabin of a pleasure yacht), and a good connector, badly installed, can allow the introduction of water when the temperature drops and the box pulls a vacuum. I was fortunate enough to be able to find some undersea-pluggable connectors from Seacon; these are widely used in oceanographic and other underwater applications, so I trust them. I was a little less confident in the gasketed BNC bulkhead connector for the 2-meter antenna, but it has so far held up to real-world abuse (including a pressure test)… I treat it occasionally with Boe-Shield to prevent surface degradation. And I fight crevice corrosion by making sure that all threaded fasteners are assembled with stainless steel anti-seize compound. Wherever objects are mounted to the boxes, they are either gasketed or sealed with an aggressive black silicone (don’t use this around coax, as it outgases acetic acid… and never apply it to fiberglass if you ever intend to use other adhesives, including epoxy). This was the technique used to handle the wire feedthroughs for the LED navlights, the horn, and the J-pole bayonet (another candidate for occasional treatment with Boe-Shield). The two switches on the yellow box are sealed with gasketed rubber boots. The wiring harness is an interesting problem: it runs about 18 feet and is subjected to cyclic abrasion, seawater immersion, and occasional yanking stresses. The inline splices are all potted and wrapped with self-vulcanizing rubber tape, and the whole assembly is spiral-wrapped (allowing drainage while still providing excellent mechanical support and abrasion resistance). The RG-58 coax is hard-wired to the bayonet-mount J-pole antenna, eliminating the need for another connector… although this does make the harness much less convenient to stuff in a bag and carry around. All this is basically playing by the rules for harsh-environment packaging, but I went just a little further (given the dollar value of the contents!). Since grit can compromise gaskets, I periodically treat the Pelican seals with silicone grease… and inside the black box there is a VCI, or vapor-phase corrosion inhibitor. This adhesive-backed sponge-like unit slowly outgasses a substance that bonds with exposed metal surfaces, preventing oxidation; you can see the edge of it just in front of the Yaesu rig in Photo B. Having a stable power system, decent lighting, and a live tracker on a kayak has added considerably to the quality of the paddling experience. 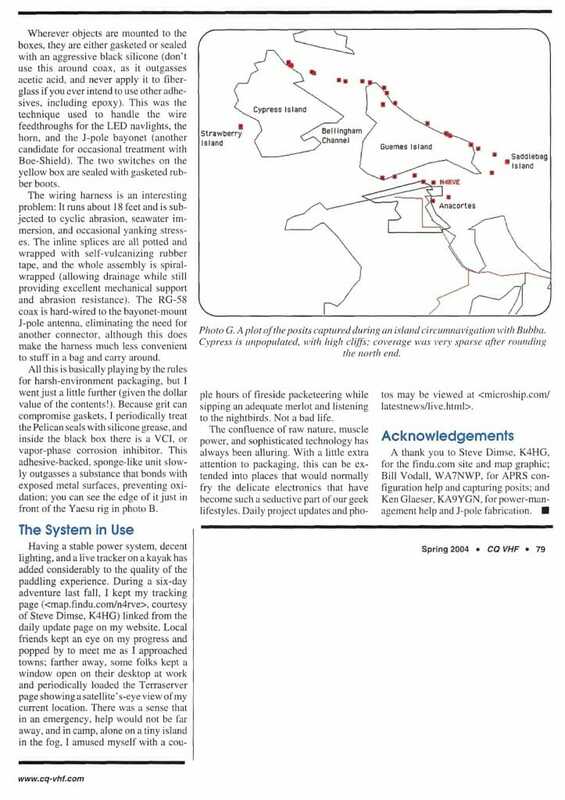 During a 6-day adventure last fall, I kept my tracking page (courtesy of Steve Dimse, K4HG) linked from the daily update page on my website. Local friends kept an eye on my progress and popped by to meet me as I approached towns; farther away, some folks kept a window open on their desktop at work and periodically loaded the Terraserver page showing a satellite’s-eye view of my current location. There was a sense that in an emergency, help would not be far away… and in camp, alone on a tiny island in the fog, I amused myself with a couple of hours of fireside packeteering while sipping an adequate merlot and listening to the nightbirds. Not a bad life. The confluence of raw nature, muscle power, and sophisticated technology has always been alluring. With a little extra attention to packaging, this can be extended into places that would normally fry the delicate electronics that have become such a seductive part of our geek lifestyles. A thank you to Steve Dimse, K4HG, for the findu.com site and map graphic; Bill Vodall, WA7NWP, for APRS configuration help and capturing posits; and Ken Glaeser, KA9YGN, for power-management help and J-pole fabrication.